November 2015 Tank of the Month!! 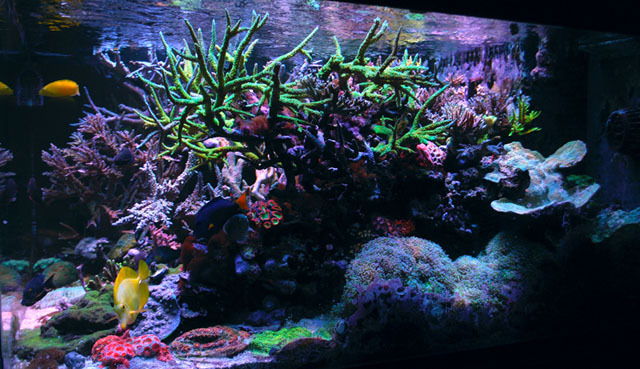 This month we are featuring Anand Kaimal's (akaimal) 240 US-gallon reef aquarium. Also check out the Reefkeeping Blog! Congrats! Beautiful tank. Thanks for sharing. Thank you! Thanks for giving me the opportunity to share my experience. Thank you Genetics for taking the time to put my article together. Im excited to see the tonga overhaul being planned. Congratulations! A well deserved TOTM! Saw this tank in person a few weeks ago and it is stunning! Thanks again for the frags! I was lucky enough to visit this tank in person, and adopt some frags for my own tank. It's often discussed how few TOTMs are run with LED. Here's a great example of one. Congratulations on a well deserved honor. Glad I got to see tis tank in person. Beautiful tank! I LOVE how it is a fairly simple tank, not tons and tons of equipment. Congrats on a well deserving tank. I'll be in Chicago end of the month for a congress appreciate if you could indicate LFS worth visiting. Thank you! Reefwise and Aquapros are both worth visiting. Thee is also a store in downtown. Forgot the name will let you know.